We offer a diverse range ofRadiatorthat is manufactured using high quality raw material under the guidance of experts. Our ranges of these are provided using superior quality materials that are procured from reputed and certified vendors of the industry. Clients can avail these from us in a wide range at affordable prices at standard norms. We deal in a compendious range of Kirloskar Radiator, which is developed utilizing finest grade raw material sourced from reputed market vendors. 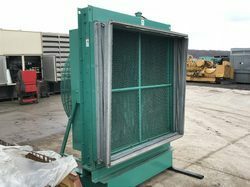 This generator radiator is used with heavy diesel generators like caterpillar and cummins. Customers can avail this generator radiator in several specifications in a given time frame at nominal rates. our radiator starts to fail your vehicle's cooling system will struggle to keep engine temperatures at a reasonable level. If you notice your vehicle’s temperature gauge reading unreasonably high, it is important to seek help quickly. 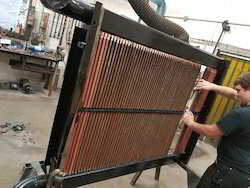 If your radiator core is not repairable we will recore your radiator with a similar core or custom-design an improved core for each specific application. Our favorite core style is what we call the 'DHLF' core. This core uses 3/4" (inline or staggered) dimpled tubes spaced on 7/16" centers for maximum water flowing capacity. The dimples in the tubes help turbulate the water to maximize cooling efficiency as well as slow the water flow down and expand tubal surface area. The other major feature of this core is the 'solder-dipped' core faces. 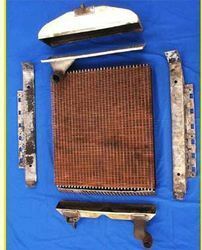 After both faces of the copper-finned core are dipped in a vat of molten solder, the fins become stronger than any other fin style except steel while retaining the heat dissipation quality of copper. We specialize in building new radiators for Hitachi processors, Madill bunchers and loaders, Kelmar forklifts and reach stackers, Cat skidders, John Deere excavators, Link-belt, Volvo, Terex, Hyundai, cummins,Taylor and many other makes of trucks and Generators. We take the OEM aluminum radiator (either all-aluminum design or copper core with tanks) and draw up a template of the tanks and the mounting brackets. We assemble the new radiators, using HD brass or steel tanks/brackets and an industrial flat fin core design for easy-breathing and self-cleaning characteristics as opposed to the lighterweight OEM serpentine (automotive-style) fin core. The customer will appreciate this complete assembly and the 'drop-in' fit. More than anything else, the customer will appreciate the improved cooling performance and less cleaning downtime. We recore farm tractor rads using in-line tubes and fins, especially for silaging/haying applications. 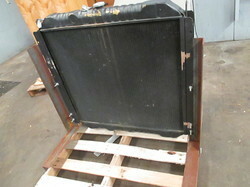 Radiator we will custom build radiators for antiques, hot rods, race cars, ATVs, etc. 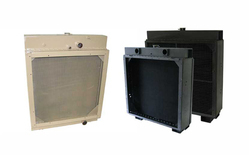 We hold expertise in offering an extensive range of Caterpiller Radiator to our clients. 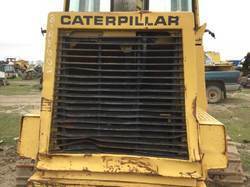 If you have a Cat folded core radiator, you will probably have experienced rust and corrosion around the panel locating holes in the tank, leading to failure. This is caused by corrosion pitting the metal surface around the hole causing it to eventually become out-of-round and oversized, and then to leak. Our range is widely used for generators and driers in various industries. 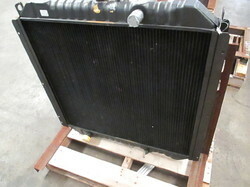 Our customers can avail from us a wide range of Leyland Radiator. The products are extremely admired or their top features. We hold expertise in supplying an extensive range of Kirloskar Bliss Radiator. These products are acclaimed for their excellent performance, high efficiency and optimum functionality. The entire range is manufactured using prime quality raw material and sophisticated machines that are sourced from trusted market vendors. We are recognized as the industry leaders by offering finest grade Greaves MWM Radiator. Since the Radiator cooling fan will be removed, there will be increase output at the same diesel consumption and the drastic reduction in noise and vibrations. The range of applications and environments that our radiators are used in are varied which is why we need to use a range of radiator cores. 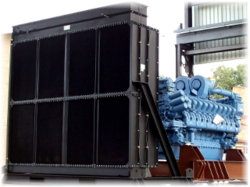 We are one of the leading manufacturer of a wide range of Diesel Generator Radiator.Technically improvised we offer our customers with premium quality Diesel Generator Radiator. Specially designed these offers good thermal efficiency thus leading to smooth functioning. We also provide customized solutions to our customers according to their requirements. We are engaged in offering a wide range of Generator Radiators to our clients. This product is widely used in different industries to provide supportive working of generators and to manage heat and pressure during its heavy working. As per the demand of our clients we are offering this product range in bulk. When a radiator core needs to be changed the following measurements are checked for accuracy by our experienced radiator technicians First the Core height (A) between header plates (Core only) is recorded then Core Width (B) from fin to fin (not including side pieces) is counted. Next is the Core thickness (C), then Header Width (D). Then the solder on tanks measure center/center of the groove. Also the Header Length (E) is measured. Number of bolt holes in each header is counted. Header Overhang is noted (F) If both measurements are the same, the headers are centered. Then the radiator core is changed. Our professionals are involved in supplying an extensive range of Cores for Gensets, which is widely used in heavy industries automotive to transfer high rate of heat. We have used optimum quality raw material, procured from authentic market vendors. Moreover, also known as pranav radiators, these products are appreciated for their optimum performance under aggressive, transient and low speed conditions. 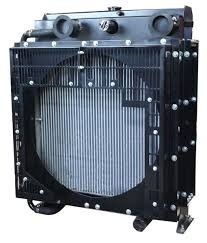 As a noteworthy entity of this domain, we render the best quality of Cummins Generator Radiator. Based on their precise needs, our customers can avail these generator radiators in various technical specifications. Reckoned as leading and well known providers of the industry we are immensely affianced in presenting our patrons a distinctive quality range of Cummins Radiator. The Radiator has special top tank design which helps in deration , venting during initial fill and ensures a positive pressure head on the inlet of Water Pump. 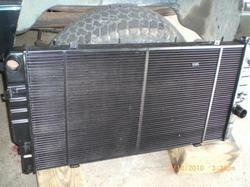 Radiator Core is provided with fins around tubes so as to increase the surface area. Being an client-centric organization, we have come up with a wide range of Mahindra Generator Radiator. The range of the radiators is designed, manufactured and exported by using qualitative raw material which is sourced from famed vendors of the market. Our offered range is offered by us in various specifications and also in customized forms to meet the variegated requirements of our patrons. 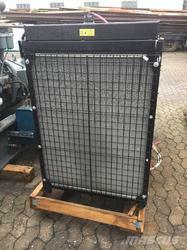 Looking for Generator Radiator ?